This artistic competition has proven to be even more successful than the last, with 70 sites taking part and over 3000 children being involved. The competition encourages anyone registered with the Scheme to invite local communities to help design and decorate their hoarding based on a chosen theme. This provides a fantastic opportunity for contractors to engage with their local community while promoting all that is positive about the construction industry. This year there was a wide range of entries based on themes such as the ‘Hope and Positivity’, ‘Children around the world’, ‘Rainforest’ and ‘Nature and Boats’. Every entry showed incredible thought and detail which shows from the brilliant designs produced. Those who took part not only got to learn more about construction and what an exciting industry it is to be a part of, but the site hoardings became artistic murals for the whole town to enjoy. I would like to congratulate everyone who took part in the 2017 Hoarding Competition. Every entry team put a huge amount of effort into their artwork, which made the judging very hard. I would like to thank contractors for their continued enthusiasm and passion to engage with their communities and promote the very best of our industry. Each entry receives congratulatory medals, certificates and goody bags as well as a trophy and a Hoarding Competition banner to proudly display on site. Winners of the competition will also receive a complimentary visit from Ivor himself! A special edition Hoarding Competition brochure listing all of this year’s entries will be published shortly. From the 70 entries, and after much deliberation, eleven winners have been selected while the remaining entries are named as runners-up. 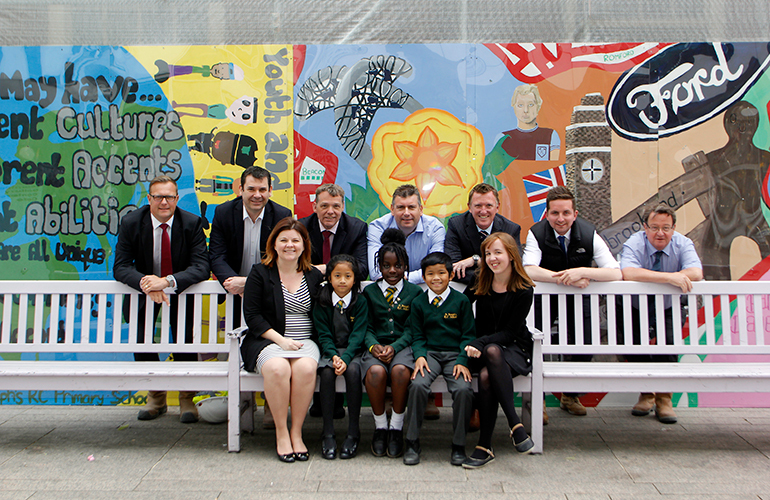 Barnes Construction’s major refurbishment of Barking Town Hall has now been given an eye-catching injection of colour, thanks to artistic pupils from two local schools. Over 60 designs were submitted to the competition by pupils from the Robert Clack School in Dagenham and St Joseph’s RC Primary School in Barking, with one winning entry from each school selected by a panel of judges led by the council leader. The children then recreated the winning designs on the perimeter fencing around the landmark site of the Town Hall which celebrate the diversity of pupils and the rich heritage of the London Borough of Barking and Dagenham. The joys of splashing about on the water are vividly portrayed on Berkeley Homes’ hoarding for its Woodberry Down regeneration project. 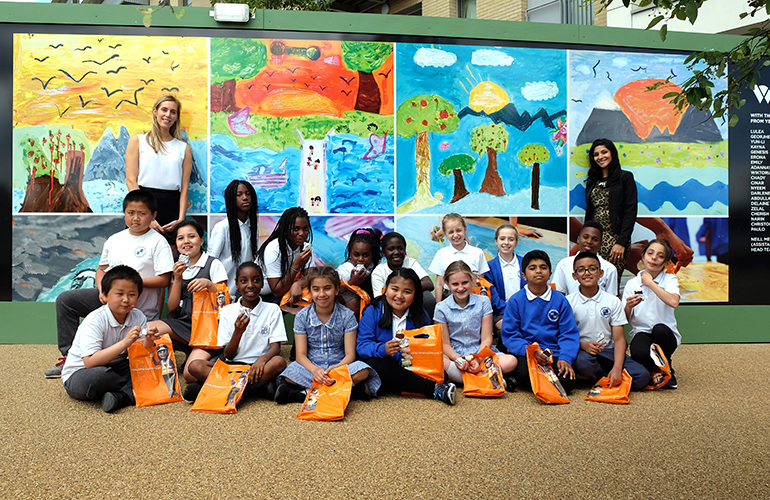 Pupils from nearby Woodberry Down Primary School in Harringey highlighted the unique features of the development – a sailing lake and a nature reserve – for their theme on nature and boats. Twenty pupils used their artistic skills to create some large canvases over two afternoons in the Redmond Community Centre. These were then prepared and installed onto the hoarding. The following week, the teachers, children excitedly gathered with Ivor Goodsite himself and representatives of Berkeley Homes to see the unveiling of their creations. 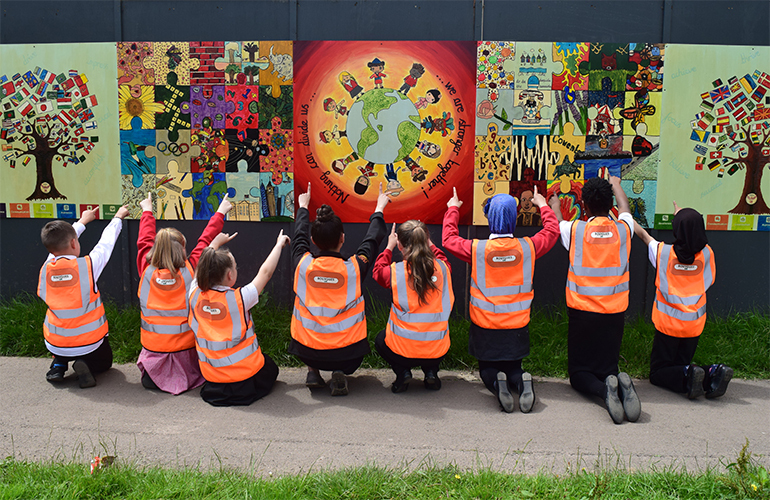 Artistic pupils from Charter Primary School, Coventry, showed their unity with children from all over the globe by creating this striking hoarding for Bouygues. 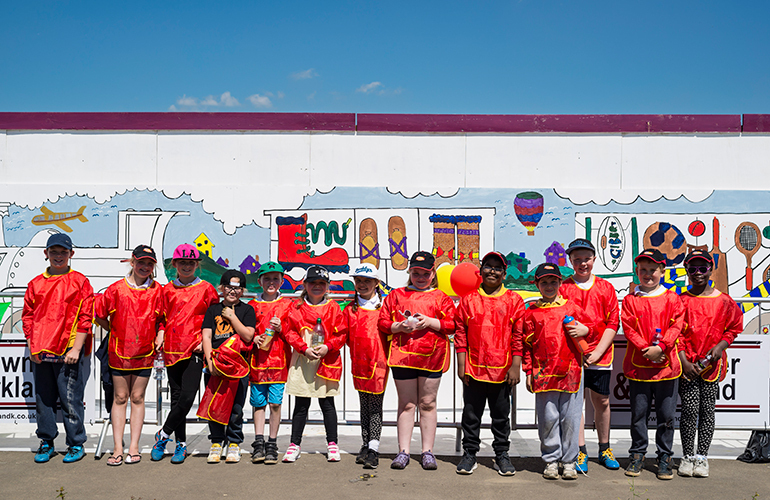 A group of 13 talented artists from Years 3 to 6 collaborated to design pieces of art to reflect the diverse world, as well as the local community, for the site hoarding at Papenham Green, Coventry. Each piece of the jigsaw represents aspects of our school curriculum and learning, with the trees decorated with flags of the world which are surrounded by the school values. The focal centre piece is a representation of our world with children from different cultures and backgrounds to show our unity. The lyric is one the children selected from one of our powerful school songs as they liked its meaning. With the help of: Pupils from Delapre Primary School, Northampton, and children of the site workforce. This fantastic train with carriages depicting the highlights of Northampton was created by 112 pupils from Delapre Primary School and 11 children of workers on site. 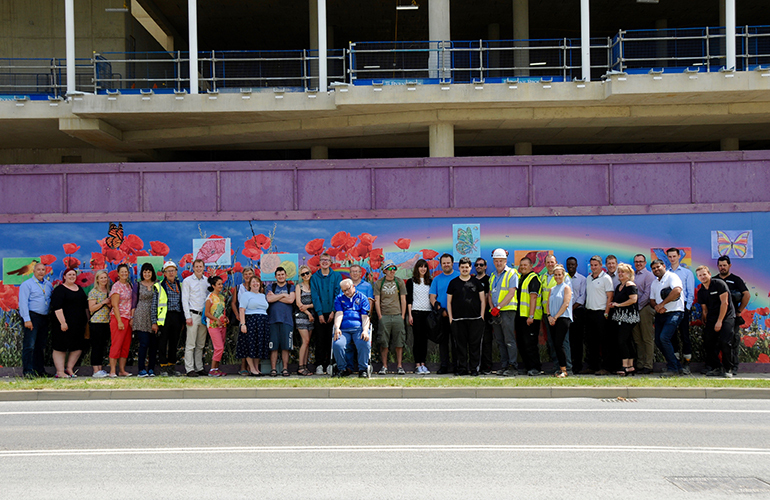 The artistic youngsters were the winners in a competition run by Bowmer and Kirkland Ltd and all of the winning art work submissions were painted onto the hoardings at the Waterside Campus project in Northampton over two days. This awesome hoarding depicts mythical and past creatures which may have swam in the River Thames, inspired by a 55 million year-old piece of fossilised limestone recovered from the sand bed. The fascinating rock, which retained clear impressions of shells, was discovered when the site foundations were being dug in preparation for the Southbank Place development in Waterloo, undertaken by Canary Wharf. This interesting artefact inspired the children to create ‘Tales of the Thames’, combining the modern London skyline with the creatures that may have swam in the South Bank area millions of years ago. 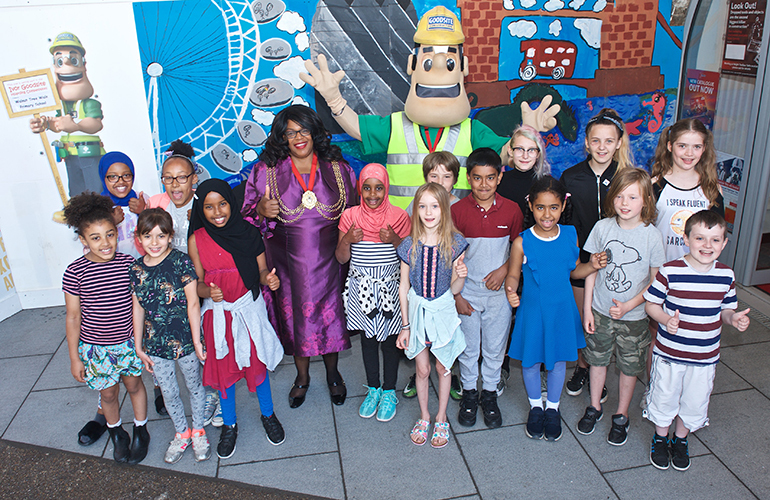 Canary Wharf Contractors, Ivor Goodsite and the Mayor of Lambeth were delighted to see the children’s colourful interpretation. 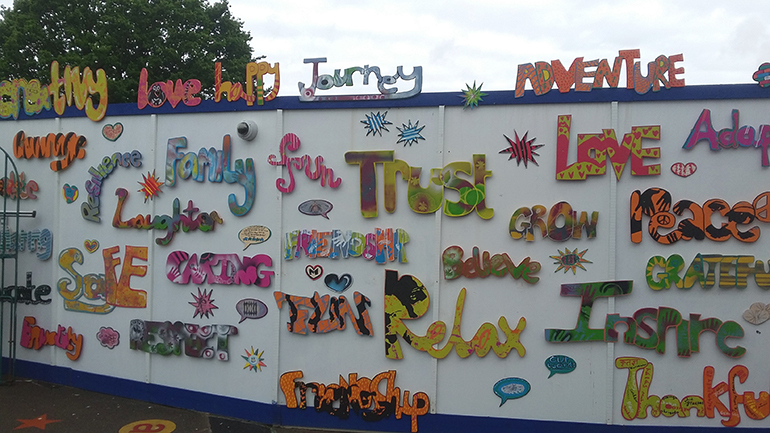 Artistic pupils from Minerva Primary Academy have created colourful hoardings surrounding their new school depicting the things that mean the most to them. Students in each class were allocated sections of the hoarding surrounding Elliott’s construction work at the school. They produced designs illustrating topics such as ‘hope’, ‘reaching for the stars’, the Bristol Balloon Fiesta and ‘Under the Sea’. A total of 310 students from every year took part in the hoarding art project and Year 6 children also produced words that mean a lot to them. These striking key words were designed and cut from plywood before being attached to the hoarding. A bright and colourful steam train displaying local scenery in the carriage windows is brightening up GRAHAM Construction’s railway embankment works project in Pontypridd. GRAHAM enlisted the support of local arts project Artis Community to carry out a Graffitti and Photography project to brighten up the hoardings in Union Street, Craig, Pontypridd. Artis Community worked with graffiti artist, Lloyd Roberts and the local community to transform the site into a mural of a steam train with a rotating exhibition of local amateur photographer’s work displayed in the train windows. This amazingly lifelike mural of the rainforest has created the ‘wow’ effect at Hill’s New Union Wharf estate project on the Isle of Dogs. 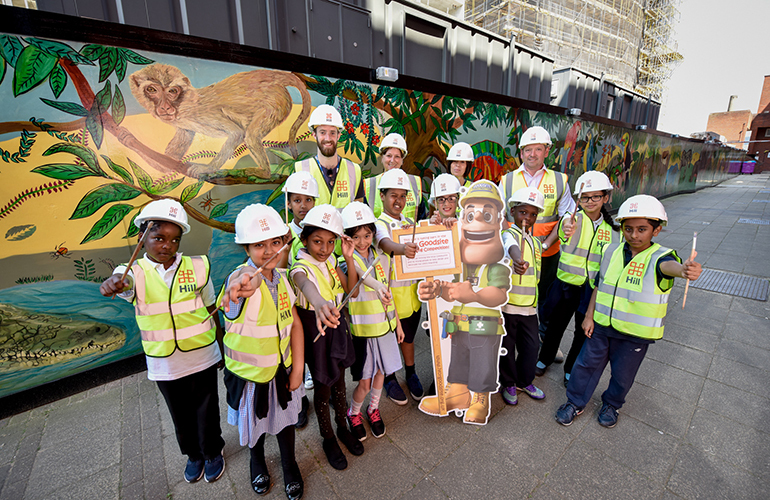 Hill and East Thames Group joined forces with Cubitt Town Junior School and local artist Murude Mehmet to transform the grey hoarding into a vibrant rainforest, teaming with colourful creatures. The hoarding faces on to the homes of many residents on the estate who can now wake up to images of frogs, birds, giraffes and even a tiger surrounding the phased housing development. Ten creative children at the school worked with Murude in art lessons to create the masterpiece, helped by estate residents in the evenings and at weekends. With the help of: Local residents and their children from around the Dover Court Estate, Wall Street, Islington. 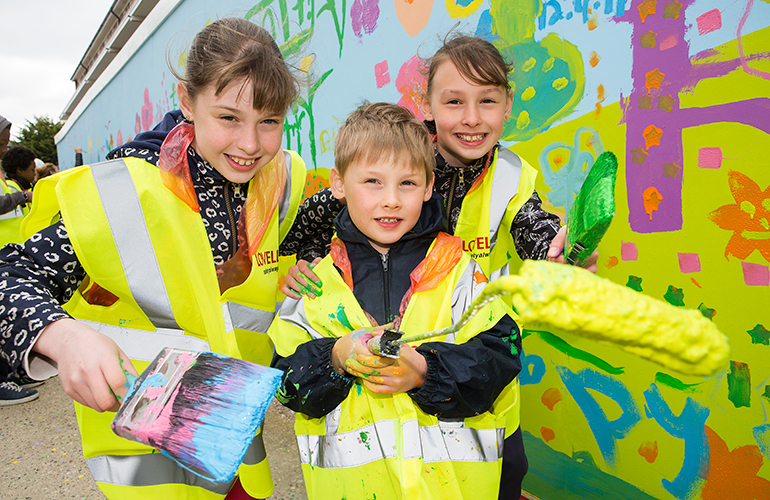 The colourful topic of Easter was chosen as the hoarding theme by Lovell Partnerships Ltd, whose site was decorated by local residents and their children. 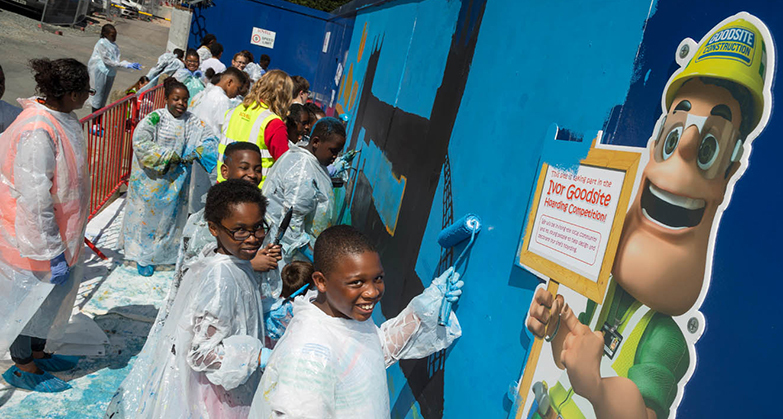 Taking up their paintbrushes during the Easter Holidays, 20 children from the Dover Court Estate joined the Lovell team in helping the hoardings spring into life. Lovell is building new homes, a ball court, parks and play areas on the Dover Court Estate in Islington. Everybody had a great day and the site team said it was lovely to see the residents and their children getting involved with the project. This striking poppy field is embellished with unique pieces of artwork created by users of Cambridge charity Red2Green. A group of 26 of the charity’s clients created the artwork for Skanska’s project for AstraZeneca Cambridge Biomedical Campus site. Skanska selected Red2Green as its project charity partner and has visited on a number of occasions to refurbish and upgrade its facilities. Red2Green supports 500 young people and adults each year with learning disabilities, on the autistic spectrum, or living with mental ill health. A background print of poppy fields was selected for the hoarding and then various images located on the print were drawn onto paper, such as flowers, birds and butterflies and these were coloured in by clients to express hope and positivity. The devastating terrorist attack at the Manchester Arena led to pupils from Denton in Manchester creating this moving and meaningful hoarding expressing love and unity. Being so close to home, the pupils were deeply affected by the events of that fateful evening, with some even having friends and family caught up in the blast. 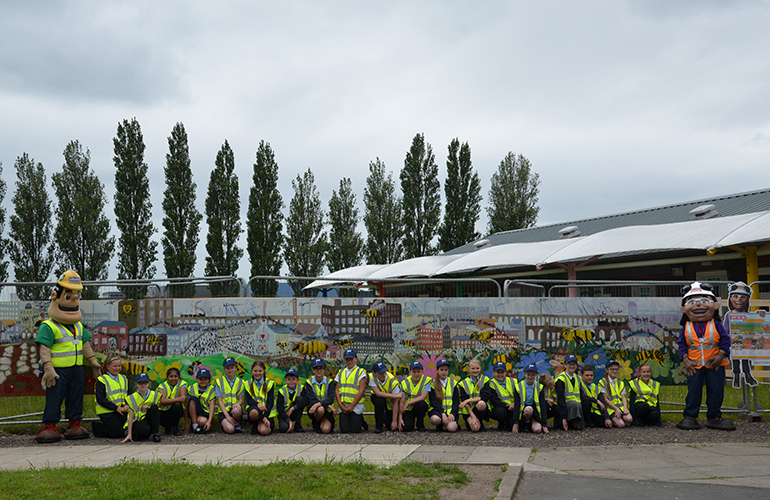 This impelled them to show their passion, strength and unity to paint Tameside MBC’s hoarding at their school with flowers, fields, 22 bees and the love of their great city, Manchester. 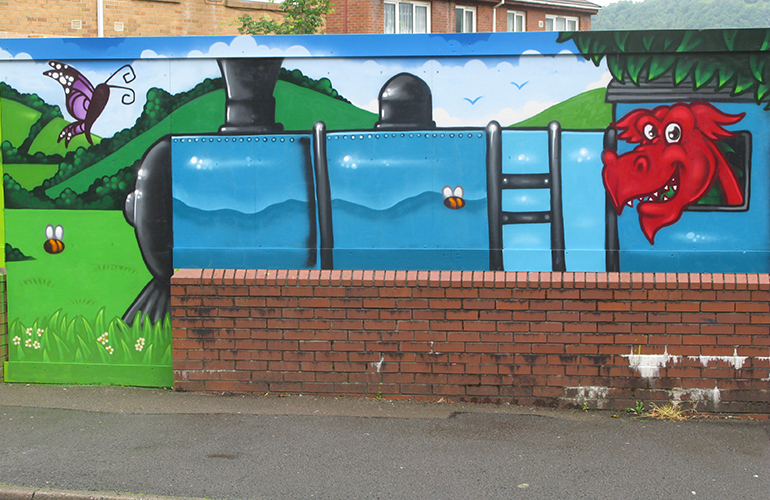 The pupils were originally planning to depict Denton’s rich history for the hoarding – the area was famous for its millinery and coal mining industries in the past. However, they changed their theme after the horrific bombing in May. The Scheme would like to thank everyone who took part in this year’s Ivor Goodsite Hoarding Competition and making it the most successful yet.